Equity is a concept always prevalent in my mind, but recently moreso. In just this past few months I transitioned from working for the wealthiest of people in the catering industry, to some of the most marginalized - adults with disabilities, in the non-profit sector. I had experiences with young people with intellectual and developmental disabilities as a student participant in Best Buddies at Georgetown University. The individuals I encountered were spirited, engaged, and shared their infectious joy so willingly and without conditions. This change in work would be a welcome one; I was certain I would be well equipped and thrive. I reported to my new position with images from Best Buddies of happiness, inclusion and youth in my mind. I was granted the chance to combine my love of service with my strategic and entrepreneurial skills. This union had been a goal of mine since graduating from a Jesuit institution that instilled a personal urgency to place service well before myself. It was finally coming together. My initial reactions were different than I anticipated. There I was arrogantly believing I would have every answer, flourish in my role, and adapt with ease to this new opportunity. I met some of the individuals the organization supports on my first day and had difficulty communicating. I was discouraged. How would I bridge the gap that significant barriers and impairments have placed between us? How can this be fair? My mind began to wander, panic ensued, and I felt helpness. I was not familiar with atypical behaviors as I hadn't experienced them in abundance before. My ignorance was manifesting as sorrow. I was saddened by what I perceived to be an unfortunate circumstance, to be an adult with multiple disabilities, to be entirely nonverbal, to be deaf as well as blind. I labeled reliance on other people as some sort of tragedy, my own ableist prejudice clouding my vision. As much as I would like to deny that prejudice exists, it does exist. Our society all too often reinforces it; just pick up a magazine or watch the news. Differences are not publicized. Instead we strive for beauty, sameness, and the predictable. Whatever is typical and safe. From this vantage point, I saw only the negatives and the can'ts. Gone were the images of youthful students participating in activities on Healy Lawn at Georgetown, grilling hamburgers, singing karaoke. This was unlike anything I could have expected. In the days that followed, I got immersed in the lives of the individuals we support. I asked for help, figured out how to communicate, and asked endless questions. I read articles, watched publicized talks, consulted my priest, bought books, and interviewed my peers. I extended my hands and opened my heart. I am embarassed to say that for a brief moment my heart, in a well-intentioned fashion, was closing me off to all the possibility in the situation. I learned basic Sign Language, I broadened my understanding of developmental disabilities, intellectual disabilities, and deafblindness, and became educated on how to handle potentially difficult situations. My unfounded fears became knowledge, my sadness and misguided compassion became power. People I encountered, my now role models, told me that there is no right or wrong: disability is neutral. We just learn as we go, and help to ensure the best possible outcomes. We embrace that every human being experiences the world in a different way. Unrealistically so, I decided in my mind a long time ago I would never be able to work with truly vulnerable people, in nursing homes, shelters, or hospitals. I told myself I was too sensitive, and these experiences would undo me. All along, I was making assumptions about the vulnerable's quality of life. It was not premeditated malice, more likely it was automatic - cultural norms forming the basis of my understanding of the world. This reasoning grounded in emotion was damaging and it skewed my perceptions. I transformed my discomfort with inequity to faith in diversity. I've seen firsthand that sadness is debilitating and helps noone. The same goes for pity. Hope however, hope begets action. Compassion. Compassion sparks change and inspires inclusion. I've stopped trying to fix things in my mind. Fixing doesn't readily happen. Through my daily encounters, my belief is affirmed that anything worth truly having would be available to everyone. There are no conditions for fitness or value. A prestigious job, lavish home, an abundance of friends, self reliance, and beautiful possessions while all appealing are not prerequisites for worthiness. The sum of our things does not equate to worth as human beings. or we would be human havings. Alas, our only requirment is to be. We are all equal parts of one societal whole. I conceptualize in food so I am envisioning this abundant pie, bursting with tender apples. We all reside as parts of this pie, slices if you will. No one person is truly self-sufficient, and if we perceive that we are, we are mistaken. It is our interdependence that makes us whole. Not strength, nor power, nor wealth. I no longer believe that reliance on support is a tragedy. I think reliance enhances our compassion, and broadens our connections as a people. Together we are an intricate whole. A perfect pie. I no longer feel like we deseve a gold star or pats on the back for being decent human beings. I no longer believe in patronizing behavior. While I always knew the individuals I met in Best Buddies were serving me far more than I was serving them, this understanding has been dramatically expanded in light of my recent experiences. Individuals that we all too easily dismiss have taught me these lessons. They have reaffirmed that love is the only currency worth measuring. To me that is true power. The most vulnerable among us enable those all too often distracted to see that simply being is enough. This book, by a teacher from my high school. I discovered his work through my research, and was overjoyed to make this connection. This article, by a woman who has dedicated her life to empowering individuals with intellectual and developmental disabilities. This TedTalk about acknowledging that our speech may stigmatize disability, breed judgment, and divide us. If you found any glimmer of truth or comfort in this piece, follow along with our organizational progress here, and to donate to our mission, join us here. Brett D'Alessandro is a Corporal in the United States Marine Corps and a resident of Verona, NJ. After returning from active duty in Afghanistan and while working at his unit in Providence Rhode Island, Brett saw a homeless man who held a sign indicating that he was a Vietnam veteran. That evening, Brett filled one of his own backpacks from his tour with some clothing and socks and gave it to the man the next morning. Some time later he saw a small child walking alongside the same man, wearing the backpack proudly. "I stopped to say hello and the homeless man explained to me that his wife had become very sick and the warming layers were helping her tremendously. It was in this moment that I knew I wanted to help others get back on their feet and give them a second chance at life.”, Brett recounts. And so Backpacks for Life was born. Supported by Co-Founders Alexa Modero and Kevin Clarke, the organization secures backpacks through donations and packs them with seasonal materials including toiletries, clothing, a notebook & pen, as well as resource pamphlets (where to find housing, insurance, jobs, etc.). Their mission is to provide homeless veterans with the basic life essentials that they cannot provide for themselves. With each backpack, they hope to not only provide homeless veterans with the things they need for daily living but also, give them hope and resources for the future. Founder Brett D'Alessandro and Co-Founders Alexa Modero and Kevin Clarke at Stand Down Weekend in Rhode Island. Backpacks for Life is spreading their mission in the community. 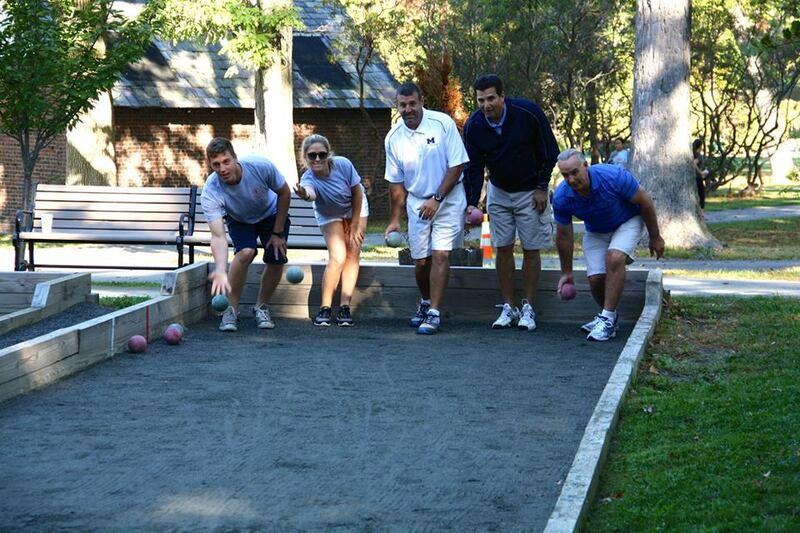 Since their launch in September, they've participated in Operation Stand Down's 'Stand Down Weekend' where they distributed 400 packs to veterans in need, hosted a Bocce Tournament raising $3,000 towards their mission, and packed backpacks with a troop of eager Brownies in New Jersey. 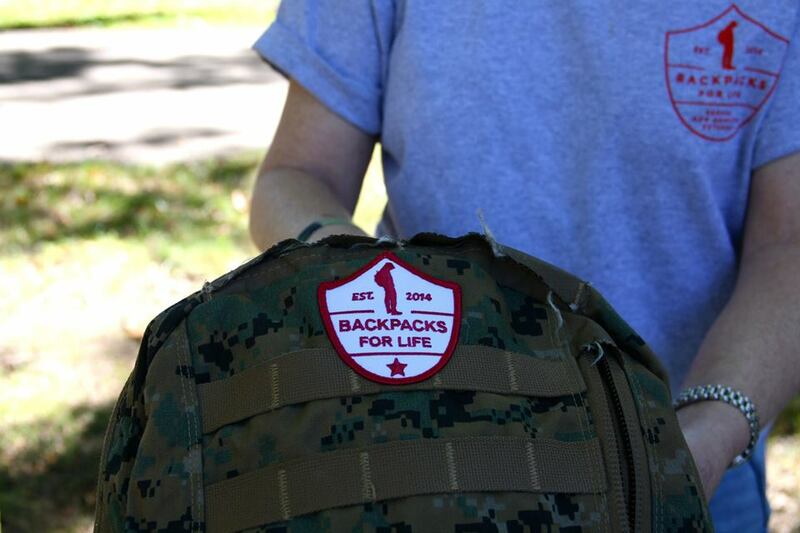 Each and every pack distributed is distinct as it is marked with the Backpacks for Life patch, designed by Joanna Maher of Look North Inc. along with the logo, website, and branded identity materials. Co-founder Alexa Modero reflects on her journey thus far. "This experience of creating a nonprofit organization makes me realize everyone has the ability to leave this world better than how we found it. By supporting veterans who have fought for my freedom, I feel that this is my way of giving back to them. Its a truly humbling experience to see how appreciative and receptive homeless veterans are towards people willing to give them assistance." While there is conflict and unrest at home and abroad, it is essential to remember the men and women who protect our nation and its people. We mustn't forget to support them after their formal duties have ended. The hardest battle for many is integrating back into civilian life. Backpacks for Life is providing a crucial service to forgotten veterans and we applaud them, but they need our help - to donate, visit their website. Interested in contributing materials, see what they provide in their packs. Look North is an award-winning creative and technology studio located in Montclair, New Jersey. What started as a curiousity of all things digital grew into a full-fledged obsession with modern communication tools and techniques. We encourage and actively participate in professional, community and personal organizations and initiatives including volunteer programs and non-profit work. We've been fortunate to work with alongside these three inspiring young people who are making an impact in the Veteran community. Creative Director and Designer, Joanna Maher, was responsible for logo, website, identity, and collateral design. To work with Joanna and the team at Look North Inc, visit our website. Some may believe Memorial Day marks the beginning of the barbecue season or the first weekend it is warm enough to go to the beach. Admittedly, we indulged during the long weekend. We got together with friends and family, spent time in the sunshine, waded in the lagoon and had too many hot dogs, but more importantly we paid tribute to our troops. Selfless men and women who have sacrificed their own freedom and even lives to ensure people they have never even met might enjoy those very things. It was a weekend laden with emotion and ceremony. My boyfriend James, former active duty United States Marine, shared a tribute with my family on Monday afternoon. He bought an extra six pack of beer. We opened each can, one by one, pouring them over the grass to honor the fallen. He cried which is rare; I cried which is not rare. Everyone cried grateful tears, appreciative tears for lives lost and the lives still entangled in conflicts around the world. Someone in the digital sphere had said we can give thanks by living a life worthy of their sacrifice. While I can't save lives in the same way, I can endeavor to make the world a tad more kind, even sweeter. I took to my large pile of magazines and found a Strawberry Rhubarb Pie recipe from the Food Network. 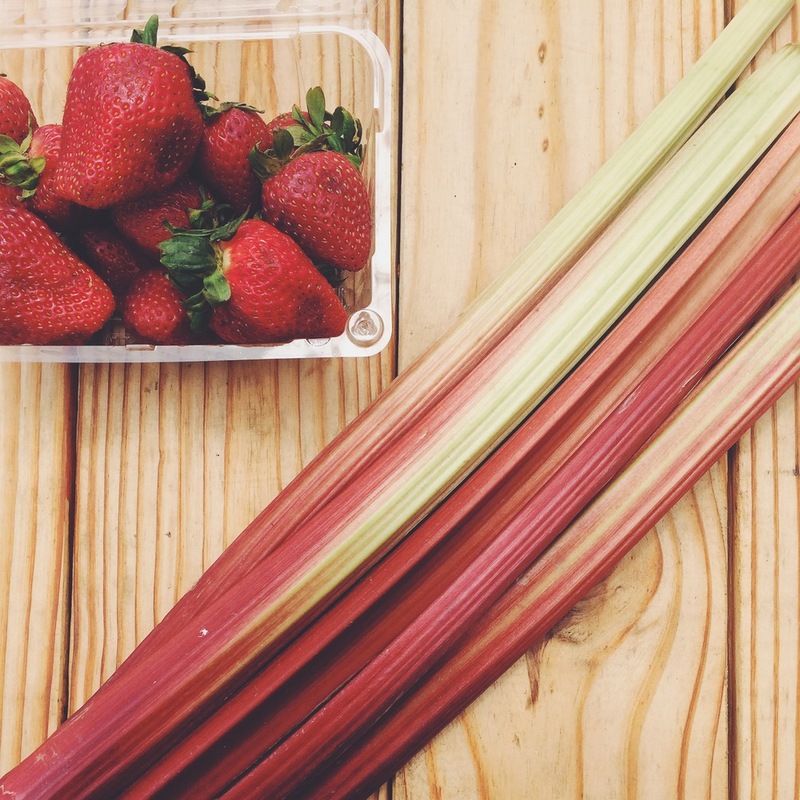 I found rhubarb at the market, an ingredient I have never worked with, and I got acquainted with its raw bitterness. I spent hours alone in my kitchen, following every step and assembling my very first pie, entirely from scratch. Berries were washed, butter cubed, and dough kneaded. While the dough was chilling we got a great rain and I listened to the calming melody of falling drops on the window sill. I rolled out the crusts and mixed the filling with sugar and the juice of just one lemon. The pie was arranged on a soaked picnic table as the drops made a lovely pattern. My crust strips may have been uneven, but the pie was bursting with character. It made me very proud to make something, every component, from start to finish. In to the oven it went, the aroma bewitching. Butter and fruit filled my home. We enjoyed the pie on Memorial Day with fresh whipped cream and touch of vanilla, silently giving thanks to the men and women away from their families. God willing most will return home, but the bitter reality dictates otherwise. May we never forgot them and strive to live lives worthy of their sacrifice.